In one of my college classes we found ourselves talking about the death of Socrates and the professor said hemlock usually causes an agonizing death by convulsions, not at all pretty to witness (or, presumably, experience). 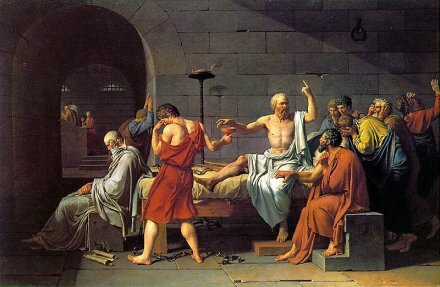 But Socrates supposedly just lay down and died. The professor suggested his death had been “prettied up” by those who wrote about it. Later on I found out there are in fact two plants called hemlock, one of which causes convulsions, the other of which causes symptoms like those described by Plato et al. All these centuries later, still moving and sad. Memory eternal, Socrates.